​Pennsylvania is a beautiful state, but as you drive along many of our highways, you'll see the sad sight of trash tarnishing that charm. It doesn't have to be that way, though. While simply telling everyone to not litter should be the simplest solution, trash still finds its way to the sides of our roads. It's not a hopeless cause, though, as evidenced by the thousands of volunteers that take time to pick up trash around the state. The Great American Cleanup of Pennsylvania started at the beginning of March and runs through the end of May. This week also marks the start of Pick It Up PA Days — April 18-May 8 — when registered events have access to reduced or free disposal at participating landfills. These days are sponsored by the state Department of Environmental Protection and Pennsylvania Waste Industries Association. 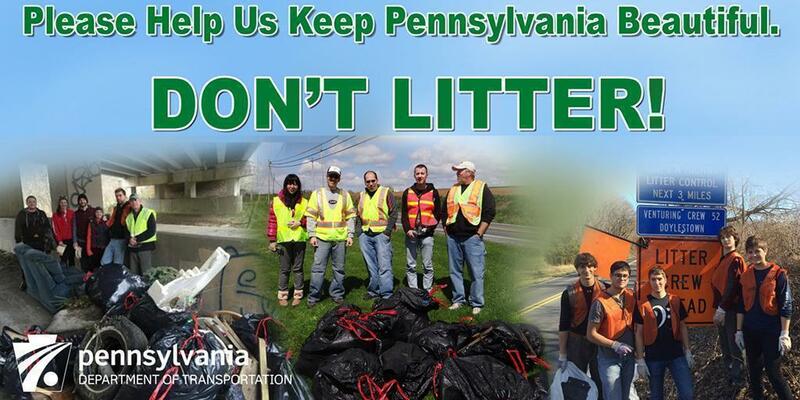 Find events on the Great American Cleanup of PA website. Last year, more than 5 million pounds of litter were collected by nearly 160,000 volunteers during the Great American Cleanup of Pennsylvania. But keeping our state beautiful isn't limited to three months of the year. PennDOT also has both Adopt A Highway and Adopt and Beautify programs that run year-round. To Adopt A Highway, volunteers sign a two-year agreement to pick up litter at least two times a year on a designated 2-mile span of roadway. The Adopt and Beautify program allows volunteers to expand upon PennDOT's planting efforts to cultivate wildflowers and/or other approved plantings along our roads. This also is a two-year agreement. Finally, the Sponsor a Highway program allows businesses to create an agreement with Adopt A Highway Maintenance Corp. to use its skilled forces to perform roadside work, including litter and graffiti removal, sweeping, landscape plantings, and mowing. All this volunteering is great, right, but you may be wondering why PennDOT crews don't do the cleanup themselves? It's part of our job, isn't it? It is, and we do send out maintenance crews when we can. However, cleanup crews need to be balanced with other priorities, like pothole repairs and line painting. What about crews from area correctional facilities? Unfortunately, the demand for "free" inmate labor by nonprofit organizations has grown to the point where PennDOT's work has become a secondary activity in the prison system. Since 2011, the Department of Corrections has chosen to partner with other organizations in using its labor force, benefiting the Commonwealth in savings other than litter pickup. Ultimately, keeping Pennsylvania beautiful takes effort from everyone. If you can, apply today to Adopt A Highway or find a Great American Cleanup event near you. If you ever see a large item of trash — like a tire or dead deer — call 1-800-FIX-ROAD or report it at customercare.penndot.gov. Headed out soon to clean up a roadway in your area? Share photos with us on social media — Facebook, Twitter, and Instagram​.